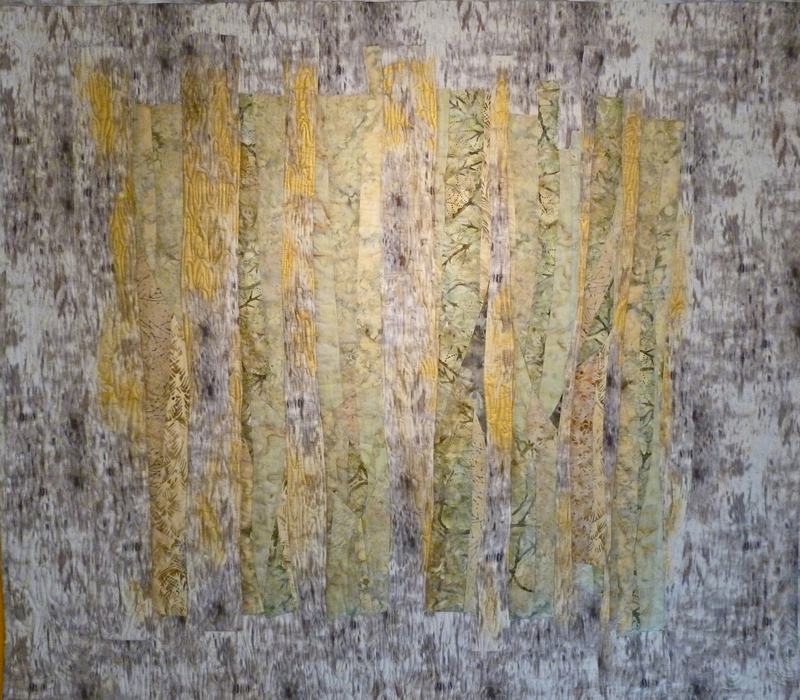 Original design by Claudia Law: “Autumn Gilded Aspens”. 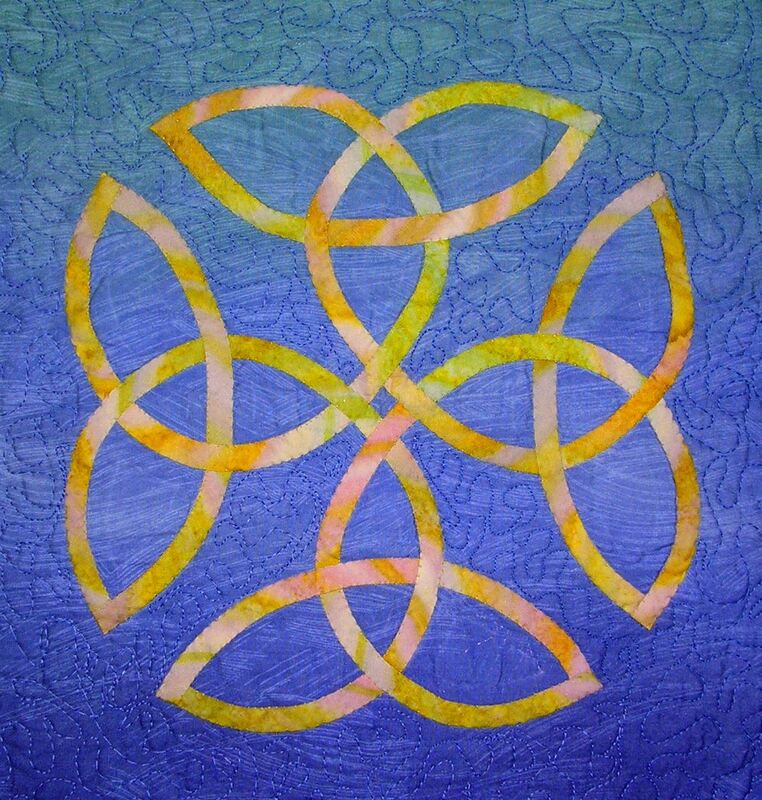 A class for all skill levels, using traditional machine piecing, with hand-painted & highlighted “trees”. 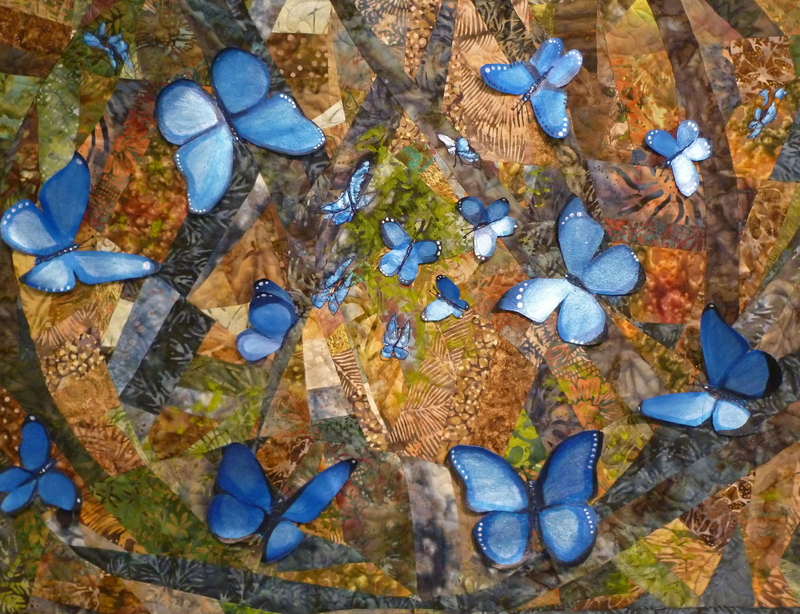 “Soft Sound of Wings” features non-traditional “Free-Style Piecing (Claudia’s original technique), with hand-painted 3-D fabric butterflies and some painting on the background. For all skill levels. 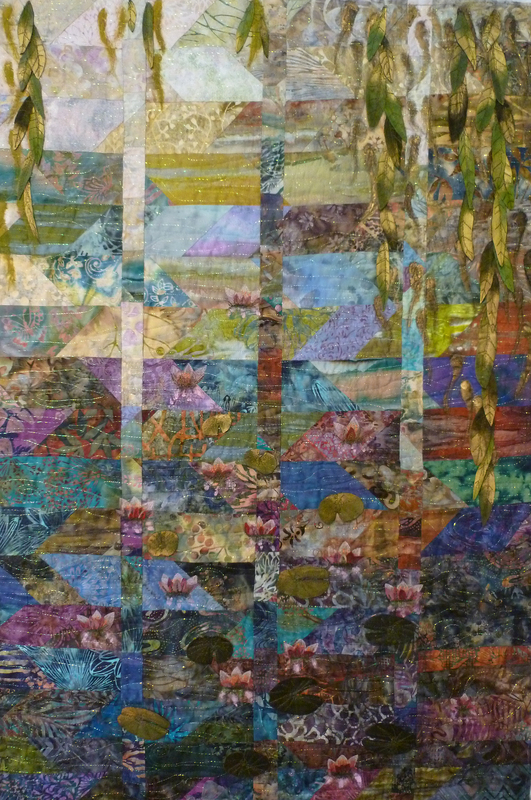 * Willows and Waterlilies Art Quilt: Claudia’s own design, using her technique, called Free-Style Piecing. Attendees learn how to embellish finished top with stitching from the bobbin, free-motion stitching, paint, fused sheer fabrics and other embellishments. Meant to be a retreat project. My “Inspired” Series. 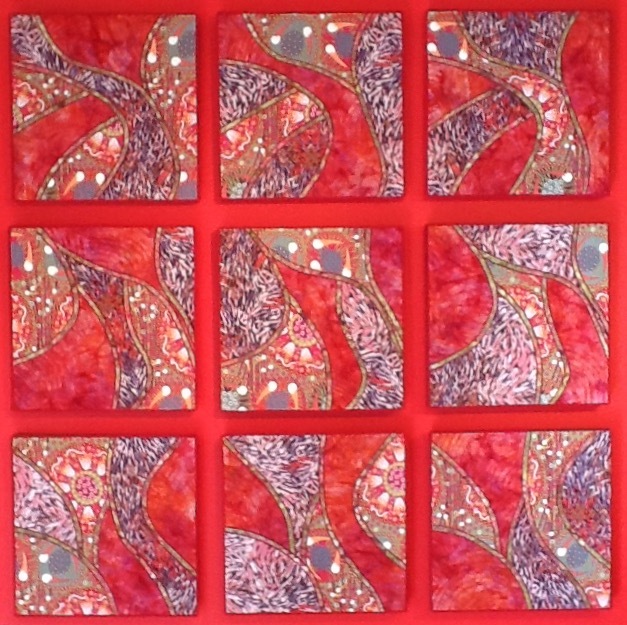 This was inspired by the work of painter, Gustav Klimt. I designed it to be made into either 9 separate blocks, mounted on stretcher bars and then hung, as a group of paintings would be, or singly, or as a triptych. Or, blocks could be sewn together, with sashing, as a quilt. The red shown between the blocks on this photo is a red wall. Another version of an “Inspired” design. This one is highly embellished with free-motion stitched, metallic gold thread,. On all the “Inspired” peices, raw seams are covered with hand-made bias strips, then stitched down with decorative machine stitching. Can be highly embellished. This is an all-day class. Celtic Knots Class. 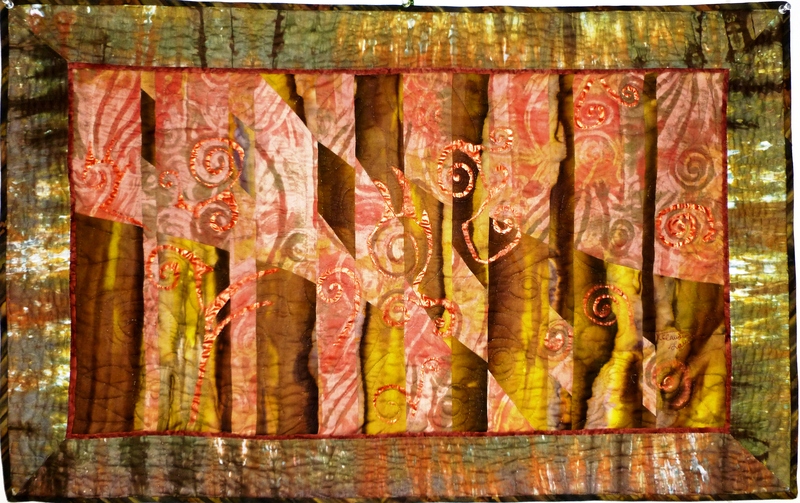 Attendees learn how to create bias strips and to hand applique them onto a background fabric. This is a 4-hour class. 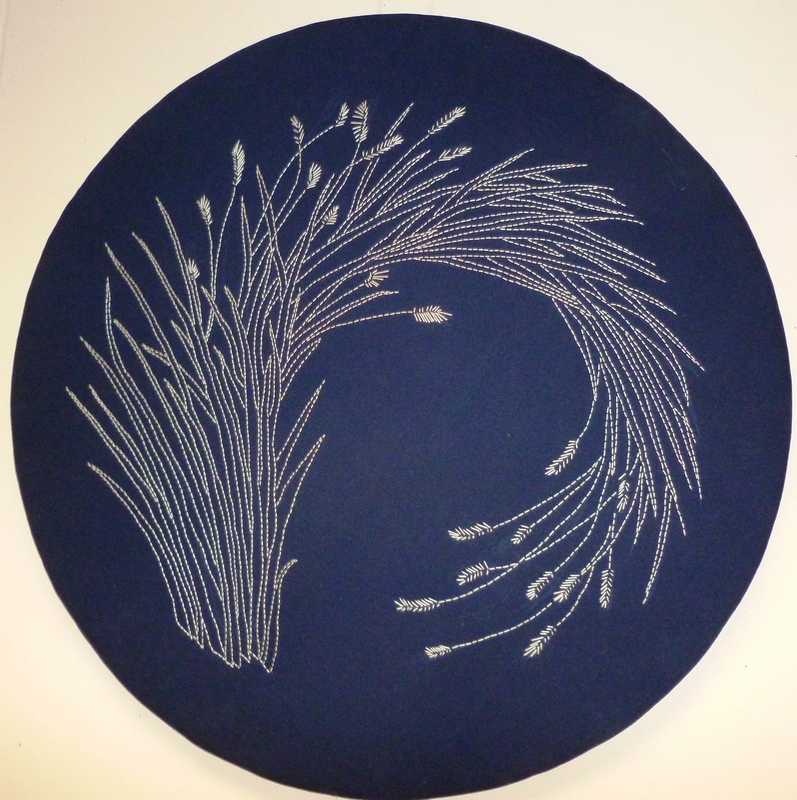 Sashiko, an ancient Japanese form of hand-stitching is taught in this class. Attendees learn this ancient stitching technique by creating a small traditional design. Each class member comes away with a packet of these designs, and can purchase the shown design which I created, based on an image drawn on an antique Japanese ceramic plate.